Fedora Atomic Host is an implementation of the Project Atomic pattern for a specialized operating system for the deployment of containerized applications. For the past two Fedora releases, we've included an Atomic Host cloud image as a non-blocking deliverable. However, upstream Atomic is moving very fast - by the end of the alpha, beta, final stabilization cycle Fedora uses, the released artifact is basically obsolete. Additionally, the Project Atomic team at Red Hat would like to do their ongoing development work in the Fedora upstream, and the six-month release cycle does not lend itself to that. Tooling is in place, we are making f22 trees daily now. 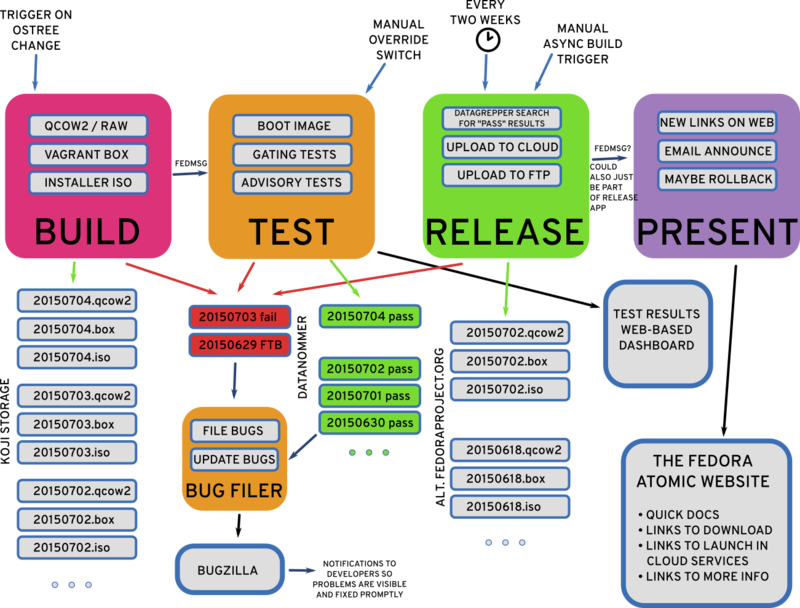 More detail: this change has four major components (refer to graphic at https://fedoraproject.org/w/uploads/2/29/TwoWeekAtomic-Overview-v2.png) - Build, Test, Release, and Present. > Build, Test, Release, and Present. The change should be in ON_QA state for the Beta. Please attend the Wednesday's (2015-09-09) FESCo meeting to explain the state if possible. Plan B: at F23 release, use the images from the traditional compose. Switch to Two-Week images two weeks later. Colin says that the Atomic dev team is good with switching to F23 as the base at F23 release -- no known need to lag. Kushal says that he's going to work with Fedora infrastructure on Monday to get the test system into production. Any longer term changes to the website or creation of a new Atomic site will need to be a new request.